I recently found out that I have to have major surgery on February 18, as you might imagine, it has thrown me for a loop. As a self-employed community event producer (Truth Serum Productions) and full time performance artist I will not have any income during my surgery and recovery afterwards. I am unprepared for the financial strain that 4-6+ weeks of downtime will create. The immediate need for this surgery is a surprise and like many artists I don't have a financial buffer, so I'm taking the difficult step of asking my friends and communities to come together and help me get though this surgery and recovery process. a concert and cabaret/drag/burlesque show of hysterical proportions! A bunch of friends and organizations are coming together to make this event happen. I'm eternally (and internally) grateful to all of the performers, organizers and MadFemmePride for their skillz and support. That's right folks, my loss is your moment to shine. 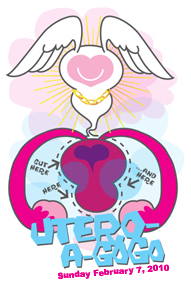 Write a haiku or two about the uterus, hysterectomy, or something close in theme and submit it to uteroagogo(at)gmail.com and it will be read on stage at the benefit. The best bad haiku will win an amazing prize! Maybe something from the fine folks of I Heart Guts! The amazing James Evelock of Collaborated Inc. designed the awesome graphic for me!